COTE DE TEXAS: Can You Spell Chandelier? 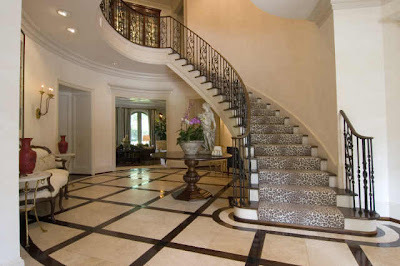 While on the internet on one of my favorite sites, Houston Real Estate, I came across this lovely home for sale. It's in the Memorial area, one of the toniest neighborhoods in Houston, and as you can see, it's quite a huge house. It's for sale for close to 9 million, just in case you're interested in buying it. But, like they say, money can't buy you taste. I got the biggest case of giggles looking at the pictures of the interior, and I just had to share them with you. Enjoy! So far, so good. It looks interesting, wood bordered limestone floor, Niermann Weeks sconces, french settee, not quite sure about the hall table, but ok. Personally, I wouldn't have put a skin like this on my stairs, but, that's what makes horse racing. 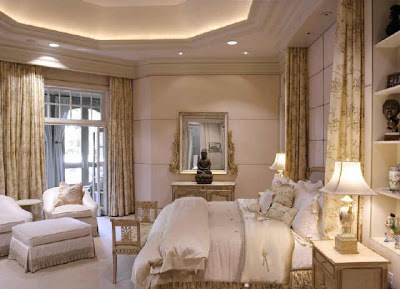 Master bedroom: Not bad. This kind of cove lighting drives me crazy and I don't really care for the large dark whatever-it-is kneeling in front of the mirror, but, all in all, it's nice. Except, wait, why do they have two duvets on the bed? Uh oh, shades of things to come??? Beware! 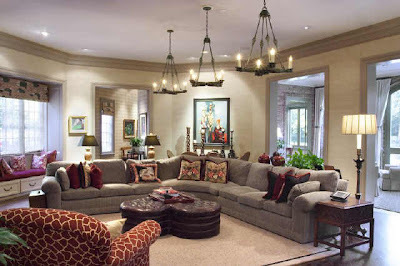 Living Room: Ok, we have two back to back sofas, good idea for a large room. 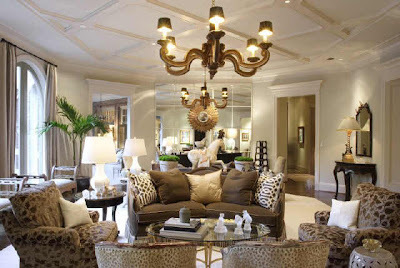 But, does each sofa have to have a humongous chandelier over it? I'm not sure that even one of these behemoth's centered in the room would have been good. But two of these are two too much. Another view of living room. Mucho animal skins. Here the chandeliers don't look so overwhelming. Maybe it's because the second one looks like a reflection of the first one? The Two Theme is really evident here. Two sets of two matching chairs. On the far left, you can see two matching settees side by side. Two for dinner? This designer really likes the "two" theme. 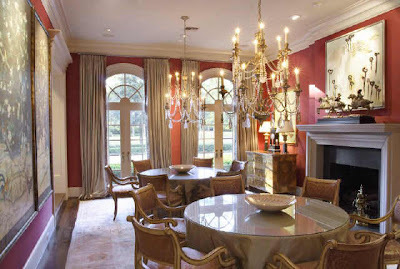 In the dining room, we have two matching tables, each with matching bowl, and of course, two matching chandeliers! I'm beginning to wonder if there was a 2 for 1 sale at the local lighting company? Oh and look, we have two matching Oriental horsemen on the mantle!!! I'm kind of sorry there aren't two fireplaces! The Kitchen: Surely, gentle reader, you didn't think there would be ONE pendant light here, did you? No, I don't mean to disappoint, but there are, of course, TWO lights, yet again. And two dishwashers. At least we're consistent here. 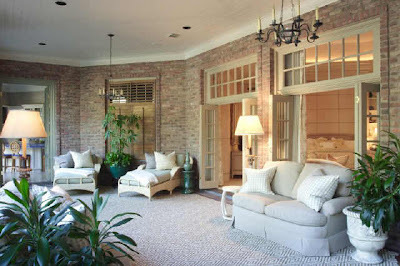 TheGarden Room: Are there two chandeliers in the garden room, too? Yes, of course! It gets really dark in garden rooms, you know, so there has to be lots of lighting. One for the sofa, and one for the two matching side by side chaise lounges. Actually, behind the plant on the left, I'm pretty sure that's a matching sofa with a matching lamp. Of course. And finally, the family room. Oh no, oh no!!!!! What happened to the Two for Two Theme? Well, it IS a large sectional and everyone needs their own light, I guess. And carrying the Three Theme further, note that the ottoman actually IS three sided, so that makes more sense. And if you look closely, it appears there are Three Sets of Three Decorative pillows on the sectional. Ok, I understand now, I think? I'm wondering, do all the chandeliers stay with the house when it sells, or are the owners going to take them all with them? Hmmmmmm. I'll keep you posted! Goodness! but like Mae West said, "goodness had nothing to do with it"! Having brunch with friends from Texas - I can't wait! Thanks for supplying the ammo. Wow, is this typical of Texax? It's so grand and formal but so so so stiff! I kind of like the giraffe print chair and I love the wood inlaid stone floor, but the rest of this could use a redo. As my mother says "there's no accounting for some people's taste"
WOW. Wow, wow, wow. This whole house is a monstrosity. Did you see the cover article in the NY Times last Sunday about "working class millionaires" who feel like they can't keep up? One of the people mentioned that once you move into a big house, your old furniture just doesn't cut it, so you just keep spending more and more and more. And what's gross about it (and likely what happened here) is that it's decorated all at once and not like the kind of home where you've collected pieces you love along the way. Oy. I am so glad you posted this! It makes me happy to have a small home with quirks. For some people all their taste is in their mouth. It's very 'Joan Collins' isn't it! It looks so lacking in atmosphere and character-like a hotel! OMG Joni, What a great way to start my morning! I haven't laughed so much since I don't know when. This is typical of clientel here in Vegas - very new money. When they like something they want 5 of everything. I had a very good client for several years and multiple jobs that we referred to only as "jungle lady". She would have felt right at home here. Thanks for the chuckle! Afternoon! I think my entire house would fit into the living room! My four cats would really have a blast exploring all of that space! And the electric bill must be astounding! LOL!! Yes -- I can't imagine that anyone there worries about such trifles! Hi everyone! I'm glad you enjoyed this and took it in the spirit of fun! I hesitated to post it because it's so negative, but I just couldn't help myself. The three chandeliered den did me in. 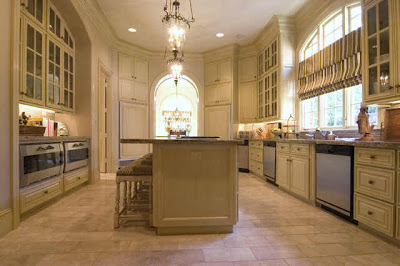 So I also counted two matching refrigerators and two matching ovens in the kitchen. And that sectional in the family room looks like a small country. Kinda taked me back to when Dynasty was on TV. Sadly, these people probably had help in doing this. This house makes me laugh a lot. It is a caricature of bad taste. And these 2 lights everywhere , it is very annoying !! This note is so good , thank you for sharing that with us. wow. reminds me of a post i did recently in response to some real estate owned by Hollywood elite... monstrous and absolutely lacking in taste or refinement. garish, ostentatious and utterly laughable! this was a real find! What a fabulous post...it combines so many of the things that I love to read/see - real estate, interior design, and a bit of the 'peeking behind closed doors' that real estate listings so wonderfully provide. If you ever want a link to some of the Atlanta real estate monstronsities, just let me know...I love your commentary! very funny--hope you dont get "caught!" The only design tip I am taking from this shrine to the buy-one-get-one-free sale is the double dishwashers. One for just clean dishes, one for dirty--you never have to put them away! Ahhhhhhhhhhhhhh too many light fixtures. A good laugh is right, I guess some of it isn't too bad once you remove the lighting...so you can't see :) Great post Joni! Really I am loving that Moroccan ottoman. 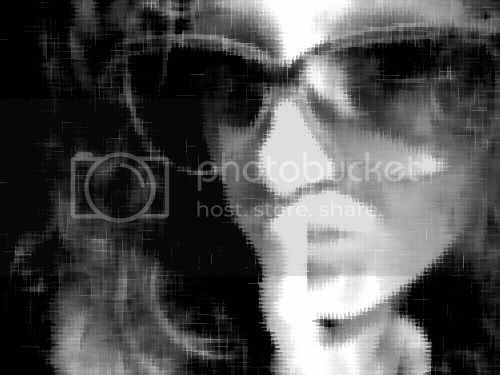 I think I must be hard wired. What happens when you confuse the dishwashers and put the dirty dishes back into cupboards, or turn on one oven and put the dish in the other, just before company comes? Did you ever read the book "Need a House? Call Ms Mouse"? It's sadly out of print, but there's a tattered one on eBay in the shops. It's a "must read" for creative children and their parents. She designed fabulous houses for her animal friends. The only dreadful design that always made us laugh was titled "Look What Piggy Money Can Buy". Enough said. Lee: I wish you had left your email address! Let me know - if you like. I'd love to get that book - I'm going to Amazon right now. Thanks for the head's up and thanks for the comments. This house just made me laugh out loud with each picture, culiminating in a den with three light fixtures! I couldn't make it up if I tried. How funny! I laughed till I cried.........thanks for the chuckle!